September 2015 – What's in That Yard? What happens when an area has a lot of natural yards? What happens when a natural yard gets sold? Natural Gardener on What is this blog? Lisa Lansing MHC 196… on What is this blog? What was Bird Species #32? 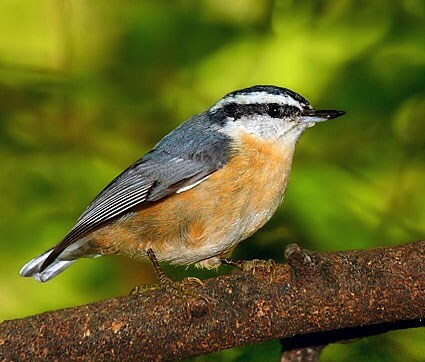 The White-breasted Nuthatch is a regular visitor to That Yard. Its smaller cousin, the Red-breasted Nuthatch, put in its first appearance this evening! The movement towards natural yards is gaining steam in Madison. It’s already a popular practice, as was discovered in a survey conducted by an east-side neighborhood association. This survey, which reviewed the front yards of about 100 homes, found that 71% of the homes were violating city ordinances. The yards contained flowers near the sidewalk or shrubs along the driveway, both of which are forbidden on the grounds that they could block visibility and present hazards to motorists. Due to changing public attitudes towards residential landscaping practices, and to the city’s new pollinator protection initiative, the local zoning board is currently revising the existing yard-related ordinances. The new wording is likely to make it more clear that the purpose of the ordinances is to prevent neglect of property, not to stop homeowners from gardening in an environmentally-friendly way. Madison’s Committee on the Environment is working on the pollinator protection plan and the ordinance changes. Their next meeting is Monday, October 19, at 4:30 PM, in room 108 of the City-County Building. Madison’s new Pollinator Protection Task Force has recently released a report on what the city can do to help bees, butterflies, hummingbirds, and other pollinators. Following the lead of the White House, which has called for an “all hands, all lands” approach to address the rapidly-declining populations of key pollinators, Madison’s plan focuses on the importance of pollinators for our food system. More non-plant habitat, such as bare ground (used by native bees for nesting) and unraked leaves (used by butterflies for overwintering). The plan notes that the major obstacle to implementing these steps is concern on the part of city residents who find pollinator habitat unattractive. The plan calls for education and outreach programs to allay fears about the perceived dangers of pollinator-friendly landscaping practices. The plan can be read here.